Twenty-five years after the introduction of the first Portastudio™, the new DP-01 8-track Digital Portastudio makes hard disk recording affordable and simple enough for all musicians. Continuing TASCAM's "Capture Your Art" campaign of making recording approachable to all musicians, the DP-01 features the one-knob-per-function design that has made TASCAM cassette Portastudios the choice of thousands of musicians. It shatters the confusing page-shift-menu interface popular with most other digital recorders. And at a price that starts under $400, multitrack recording to hard disk has never been more affordable. The DP-01 has two mic inputs on ¼" TRS jacks for dual mono or stereo recording. 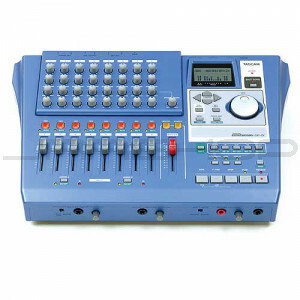 Its eight tracks record at uncompressed CD quality to an internal 40GB hard drive, and a stereo master track is available for recording a mix. Each channel of the DP-01 has a 45mm volume fader, plus dedicated controls for pan, effects send, high EQ and low EQ. An LCD display shows meters, editing settings and locate points. The DP-01 has a USB 2.0 jack for file backup and transferring mixes to a computer. There are analog RCA line outputs, a headphone out and S/PDIF line output. For more inputs and effects, check out the DP-01FX. It adds XLR microphone inputs with phantom power for connecting professional condenser microphones. It has a multieffects processor for adding effects to an instrument during recording and a reverb processor for adding effects during a mix.